Right now, there are hidden pockets of revenue sitting in your business waiting to be discovered. New technologies are taking the restaurant business by storm. Stop wasting countless hours on spreadsheets and printed reports. It’s a waste of time and a productivity killer! Let your managers cater to guests and staff rather than dig through piles of papers and POS Reports (which often get pushed aside). Want to know the secret for growth? It’s right there in the numbers your business generates waiting to be discovered. As an Upserve Partner, Cover Funnel can set your restaurant up for success and give you the big data tools for a few bucks a day. Identify things that are bringing people back – or making them never return – and create actionable decisions based on customer behavior. Includes a custom data report from the Cover Funnel Team each week specific to your restaurant's needs. 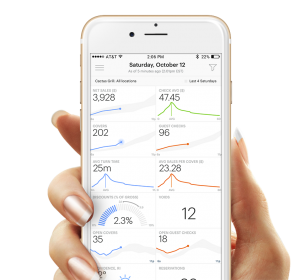 Sent out weely for you to bring to your meetings, it's like having a team of data experts right there in the room with you! Using data we can find out which dishes are more likely to bring guest back in the door over time. Also, we can flag the items more likely to cause a guest NOT to return. Vital for continued growth! Never spend thousands of dollars a month on high priced in-house consultants. That’s what your management team is for. What our service offers is a simple solution to making better decisions that your team can put in place. Cover Funnel Data Analysis Services checks all these boxes. With integrated software, we can generate and read the numbers that your business produces. These numbers are the backbone of your business, reading them incorrectly or not at all can spell disaster. We are so sure that you will get your money’s worth that we are willing to offer our services for FREE for a limited time so you can witness the power of data in your business. Contact us now to learn more about what Cover Funnel can do for you; this risk-free offer will only be available for a short time and carries no long-term commitment. How many restaurants does this pricing cover? Pricing is per location, if you own multiple units we can offer bundled packages upon request. Please reach out to us for a consultation for all multi-unit pricing. We are partners with Upserve which can supply an amazing amount of data from your restaurant POS and other sources. If you are not a current Upserve customer reach out to us today to learn more. We can have you set up at minimal cost in no time at all. If you are not interested in data software we can still provide services but it will require a more hands on approach with someone on site in your restaurant. Our data analysis will provide you with insights into your customer behavior and supply you with actionable recommendations to expand the things that are working and discontinuing the things that are losing you customers. Cover Funnel data analysis is simply based on raw data, we look at things from a different angle to provide you with valuable insights into your business that would otherwise go unnoticed. Reach out to us today to learn more! What does “two months of free Data Analysis” include? For starters, consultants think we are crazy for giving this service away for free(most of them charge thousands per month). Those already working within our system are amazed at the value they are getting. Restaurants produce a tremendous amount of useful data. Most of this information goes unused. Our aim is to help restaurants make better business decisions based on that data. Provided you qualify for our Free Data Analysis Service we will pour through your information and provide your team with actionable feedback outlined in the Standard Package. There are no strings attached here. There’s no commitment to continue services after your two free months have expired. The only contingency would be, that you already have, or are willing to set up a service to compile and organize the data. We can refer you to one of our partners for a very inexpensive way to do this if you don’t already have a service. Without that it would be very costly and time consuming to organize all the numbers for the restaurant management team. There’s no downside here. During our time working together, we guarantee you we will make you more money, and change the way you think about your data in the future. Your restaurant is a business, take advantage of the wealth of information available to put yourself in the best position to succeed. Schedule your Consultation now, space is limited for this one time offer!